If emerging trends in technology are any indication, the demand for IT consultants will be growing faster than ever before over the next decade. Industries are already laying the groundwork for the incoming 5G communications networks, while the Internet of Things promises that thousands of connected and "smart" devices will streamline and automate virtually all of life's little concerns and industry's big systems. Consequently, today's IT professionals will be doing themselves a favor when they get their business and accounting practices in order before the deluge of demand for their services inundates them. The IT professional services automation (PSA) software from Beyond Software gives them the tools they need to streamline their project related activities so they can be fully prepared to take on the first (and every other) big job opportunity that knocks on their door. The development of the Internet 30 years ago launched what some experts call the "4th Industrial Revolution." Over the course of those three decades, technology sciences have built exponentially on those early foundations, adding new services and features almost as fast as humans could imagine them. Today, the technological infrastructure underpinning the global market and industrial complex is prepared to offer more, faster, better services through systems and channels just recently introduced. As a result, companies who want to maintain market share or grow into new sectors will need comprehensive technologies to get and keep them there. Organizations that don't have the resources to build out a fully functioning IT department will rely on the services of a professional IT consultant to help them structure their hardware, software, and infrastructure to get the job done. Emerging recognition of best IT practices indicates that some combination of on-premise and cloud computing capacities offers the most robust corporate technology set-up. IT consultants will be asked to identify how to best establish and manage this "hybrid" cloud configuration. Beyond simple software, this discipline requires knowledge of the sensors, beacons, and hardware that bring "life" to inanimate objects, as well as the security and deployment issues that affect it. Most companies want to retain as much of the invested value of their legacy systems as possible. IT consultants can help them attain those goals. Fortunately for IT professionals, professional services automation has evolved alongside their industry to capture the nuances and details that are unique to each consulting project. The IT consultant PSA software from Beyond Software is designed with this specific profession in mind so that IT professionals can accurately bill out each skill and capacity. The programming facilitates interactions with all project-related entities so that all offered services are captured and recorded. 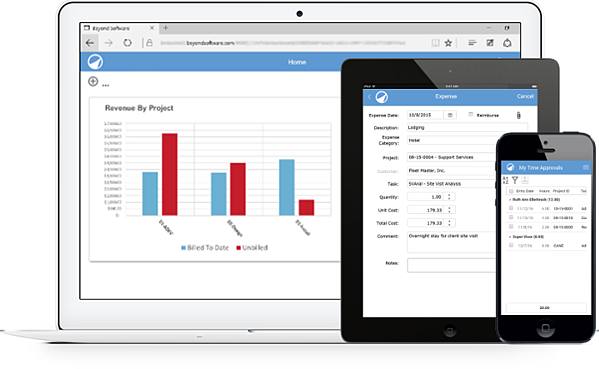 And the dashboards, consoles and reporting are customizable, so you can create the reports and accounting processes that work best for you.